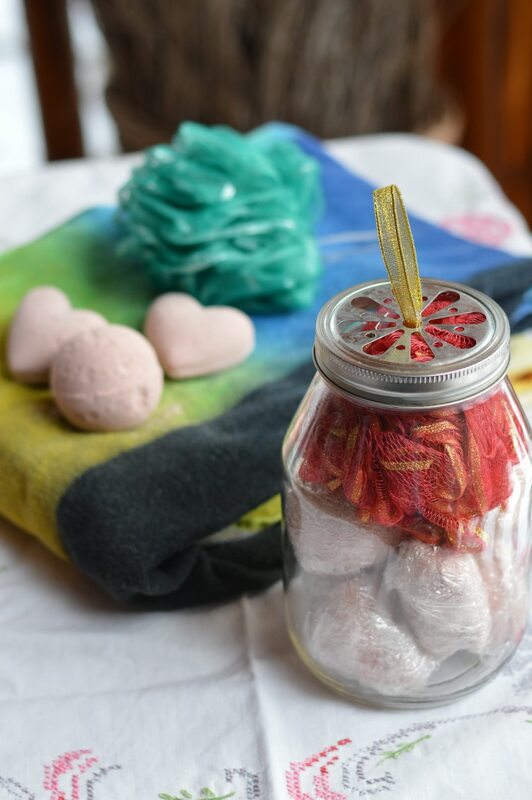 DIY Relaxing Rose Bath Bombs that are exquisitely giftable. 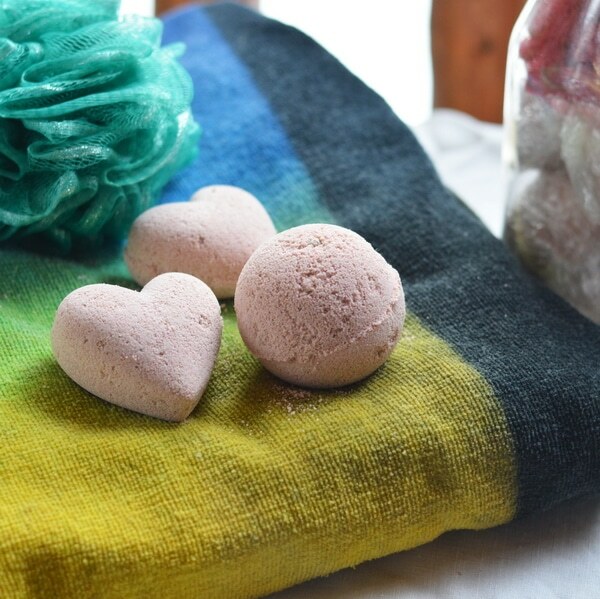 Bath bombs are a fizzy parcel of hydrotherapy in a joyful single serving portion. The dry bath bomb enters the bathtub and immediately erupts in fizzy, foaming delight that is reminiscent of the volcano demonstrations at grade one science fairs. However, the bath bomb is even more wonderful because it explodes with fragrance and herbal goodness, moving a mundane bath into the realm of therapeutic delight. But even though they are wonderful, soothing, and fragrant, the technique necessary to make them at home is difficult to master. I thought bath bombs would be my defeat. 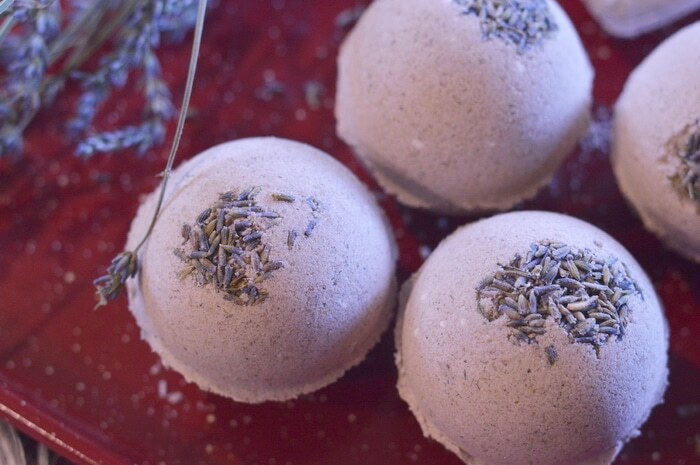 For a few years now I’ve tried to make bath bombs for gifts. I’ve had eternally fizzing messes rather than giftable bombs. I’ve tried changing the recipe, using witch hazel instead of water, Dead Sea Salt instead of Epsom salts, and even omitting the essential oils. But nothing really stopped my bombs from fizzling out prematurely. Now the good news is that bombed bath fizzies, once dry, can be broken up and put in a jar for a bubble bath. But they just aren’t as fun to give as gifts. Bath salts aren’t too expensive in the store. But fizzy bath bombs are Lush-worthy at $7 apiece, in Canada. That’s an impressive gift, don’t you think? This recipe was a collaborative effort. As I was close to giving up in defeat, I asked for a little help from my tribe. Amanda from The Orange Blossom Soap Company in Amarillo, Texas, analyzed my recipe for me and gave me her expert advice so that my next bath fizzy wouldn’t bomb. (pun intended) Thank you, Amanda. The ladies on my gift list thank you. Choose a day to make bath bombs when the humidity is under 40%. 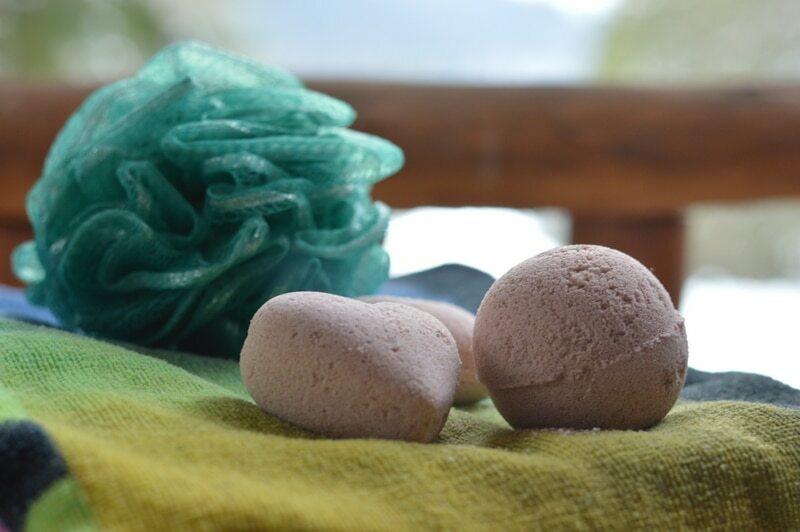 If you have a high humidity day, with a chance of showers, the salt in the bath bombs may absorb moisture out of the air and fizz up prematurely. It’s not a good day to make bath bombs if it’s raining. This bath bomb gets its pink shade from rosehip extract, which is a water-soluble colouring, rich in vitamin C as well as 32 other vitamins and minerals. Rosehip extract is astringent, anti-inflammatory and helps with joint and muscle pain. It improves the elasticity of the skin, as well. Doesn’t that sound perfect for YOUR luxurious bathtime? The colour is pale until you start spritzing it with alcohol. But when it hits the bathtub, you’ll see a nice pink fizz, while it adds all of its rosy nourishment to the bath. The essential oils in this recipe were picked for their relaxing, anti-inflammatory qualities. Cedarwood Atlas essential oil is known to reduce cellulite and increase feelings of relaxation and well-being, while rose geranium and lavender are both anti-inflammatory and analgesic, with mood-lifting qualities. The predominant scent is rose. Place baking soda, sea salt, clay, rose hip extract/colorant, rose hip seed oil, and lecithin into the mixing bowl. 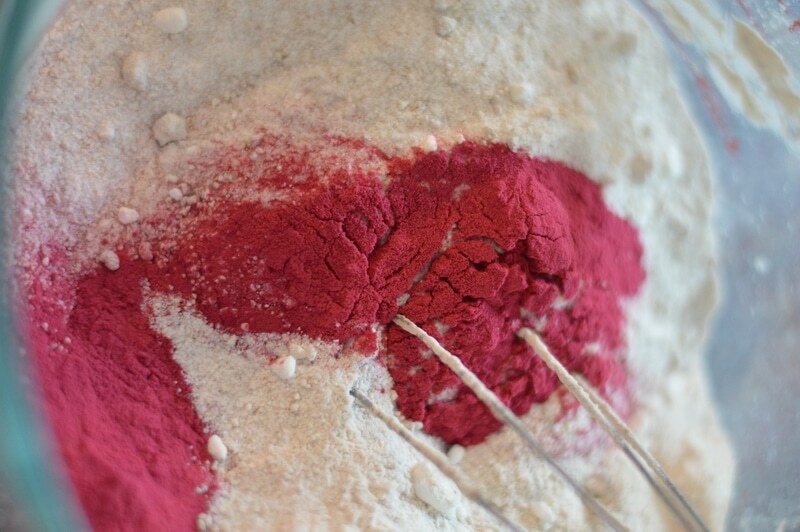 Whisk the mixture to blend in the color and remove any clumps of baking soda. Whisk until it is of uniform fine consistency and a pale pink in colour. Using the whisk, stir in the essential oils. Mix well so that the mixture has a uniform consistency. Whisk the citric acid into the mixture. There is no water in this mixture so there should be no foaming up. Mix fully with the whisk. There is no need to treat the molds. The mixture will drop out of the molds without issue. Working in a well-ventilated area, spritz the mixture lightly with the alcohol, while whisking to prevent a fizzing reaction. Avoid breathing in the alcohol. Add only enough alcohol to allow the mixture to clump together when squeezed in your hand. It should have the moisture content of barely damp sand. Try three spritzes and then check the consistency. Test it to see if it will hold together. It should be fluffy after spritzing, not dense and wet. Only add more alcohol if the mixture won’t hold together easily. How much alcohol you need depends on the relative humidity in your air. 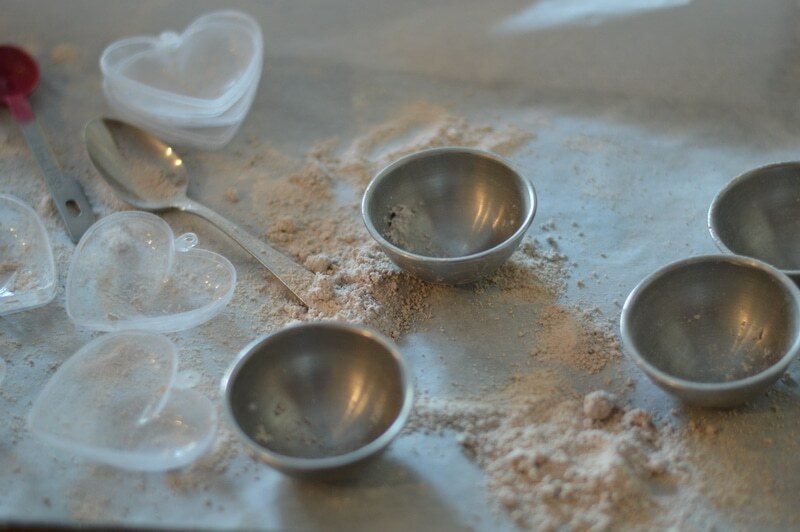 Using the bath bomb mold, scoop up enough of the mixture into each half of the bath bomb, so that both sides are over-full. Really pack it in. Press the two halves of the mold together tightly, to compress the bath bomb mixture into a tight package. Brush off any excess mixture. Allow the mold to sit undisturbed for 10 to 15 minutes. Tap the outside of the mold on both sides with the back of a spoon to loosen the bath bomb. Open the mold and pop out the bath bomb onto a piece of parchment paper-lined baking sheet. Be gentle. The bath bomb will solidify as it dries. Allow the bath bombs to dry overnight. Turn it over and dry for an additional 12 hours. Wrap the bath bombs in plastic wrap or a shrink wrap, if desired, to make them more secure if you are gifting them. Drop one bath bomb into a bath of hot water, just before you are ready to enter the bath. The lecithin allows the oil in the bath bomb to mix with the water so that your tub doesn’t become slick with the oil. Don’t use Epsom salts or Dead Sea salts. Save these for bath salts. The magnesium draws moisture from the air and encourages premature fizzing. Go easy on the percentage of oils in the recipe. Too high a percentage of oils can cause the bath bombs to remain soft, instead of hardening. Use 90% or higher isopropyl alcohol as the liquid. Water, witch hazel, and other common liquids used for bath bombs are fine in a desert climate, but if you live where there is any humidity they will cause premature fizzing. Isopropyl alcohol evaporates quickly so you can avoid the worst of the fizz. Begin the recipe with 2 parts baking soda to 1 part citric acid and 1/2 part modulator like rice flour, salt, or clay. The modulator inhibits the reaction between the acid and the baking soda, giving you more time to mix in the liquid. Avoid liquid food colourings until you are comfortable with the method. Water soluble color can be added to the alcohol in the spritz bottle. One cautionary tale. Do avert your face from the isopropyl alcohol fumes, as you are working. I didn’t the first time and had a painful day or two till my lungs worked out the inflammation. I wrapped my bath bombs in plastic wrap, but if you have some pretty gauze drawstring bags, they would be perfect for displaying the bath bombs. And they could be reused over and over again. I gifted these in a recycled 1 ½ quart glass mayonnaise jar with a wide mouth lid. I tucked a bath pouf in the top and put on a daisy lid to allow the ribbon from the bath scrubby to pull through. 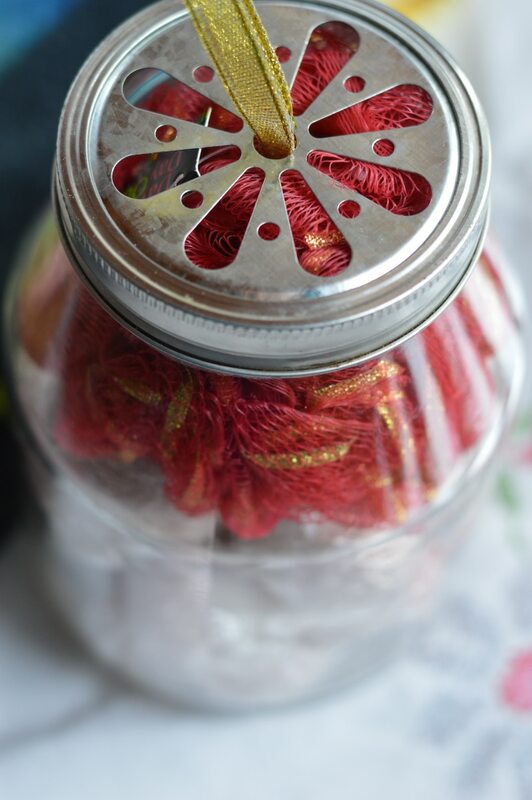 This lets the sweet rose fragrance out of the top of the jar. The 1 ½ quart jar held 6 bath bombs, but a one-quart wide mouth jar held only 3. My friend, Jan Berry of The Nerdy Farm Wife has been crafting herbal bath bombs, herbal bath salts, and exquisite natural and herbal soap. 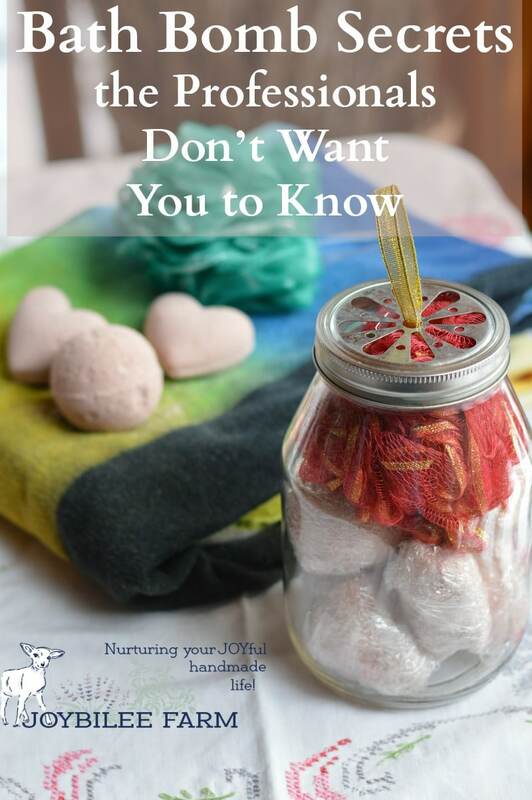 She captured her process and creative recipes in a neat package so that you can re-create her natural and therapeutic bath products in your own kitchen. Herbs and Essential Oils Super Bundle with Ultimate Bundles here. 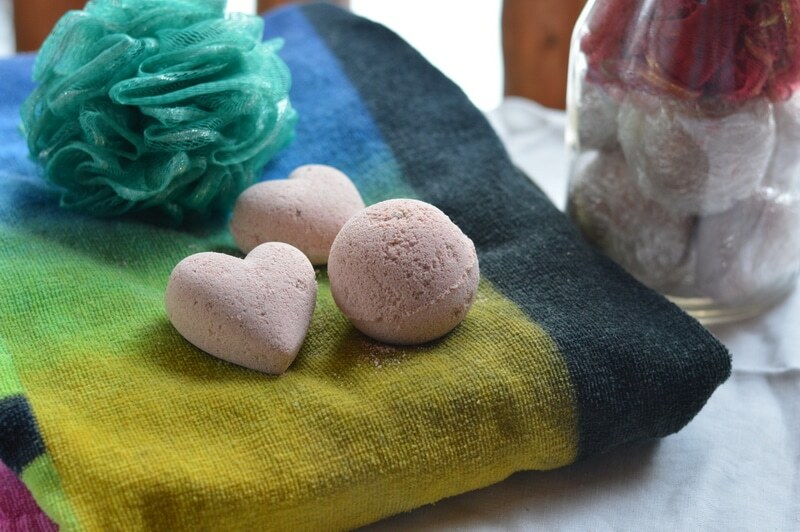 Simple & Natural Bath Bombs! Have a look at Jan’s book here. Thank you for the post! I am so happy I found it. Tried making bath bombs once before and they didn’t turn out right. With your “recipe” and instructions they came out near perfect. I want to try doing some with dried goat milk & colloidal oatmeal with more of an almond scent. Do you have a guide on how to make that? What would you recommend to add color to bathbombs? Have you used mica powder? Corella or spirulina make bath bombs that are the color of Tiffany Blue. Powdered hibiscus will give you pink. You can also use food coloring. Mix it in the rubbing alcohol so you don’t add too much water to the mix. Or use paste food coloring and mix it in with the oils before you add them to the bath products. What size molds do you use? I used what I thought were large, but this recipe gave me less than 3, not the six noted. Is it possible to give safety advice. It is important to wear a mask when mixing the dry ingredients. Also it is important to wear gloves. I have looked at many sites an nobody seems to give advice on this. Thank you. Is the rose hip extract a powder or liquid in this recipe? I just started experimenting with making bath bombs, using isopropyl in a spray bottle. For my first attempt, I made just enough to make half a bomb to try it out. It felt like I needed way more isopropyl than the recipe called for, but the bath bomb turnout out perfectly, so no problem. So today I tried the full recipe (enough for one big bomb or two halves.) I found I could not get enough isopropyl into the mixture fast enough to get it damp enough to put in the mold. It kept evaporating! I ended up breaking up bits that had already set, respraying it super fast til it was really quite damp and restuffing the molds. We’ll see how that works. But here’s the thing: humidity was 90% today. I’m in a super cold climate though. Does that make a difference? It doesn’t feel humid here at all. Humidity was the problem and why you had to use so much RA. I try not to make my bath bombs unless tha thumidity is at 40% or below. This is the killer for me because I too live in an area where humidity is prevelant, so these for me, are very limited. And another factor…even though it may not feel humid…it can be even in cold weather! I have a handy app on my phone that tells me what the humidity is at any given moment. You may want to download this hand little thing….it will help you in the long run. Good Luck! Hello, I just ordered you complete kit for the bath bombs and other recipes and I am so excited to try out these bath bombs. Quick question. Sometimes I don’t want to use bath bombs but rather a soak that is made from the bath bomb ingredients that fizz. This means I don’t want the powder to turn hard such as the bath bombs. How can I adjust the recipe to give me this loose powdery end result without the clay? Add more oil to the recipe. That will prevent the clay and salts from sticking together. But don’t forget the lecithin or your bathtub will be slippery and might be a hazard. Thank you. I will try that. May I use something other than clay such as tapioca starch or arrow root? Would that work as well and do I lower the ratio (meaning less starch to baking soda) to also help keep the powder from hardening? I am so glad you mentioned the sunflower lecithin in your recipe. I am making shower steamers and they are molding well. However the essential oils aren’t lasting long enough…what am I wrong?? You may need to use a little bit of Dr. Bonner’s Liquid Castile Soap in the shower steams to hold the essential oils in suspension. Liquid Castile Soap can act like a carrier oil with essential oils. It sounds like you might have high humidity. Epsom salts do absorb moisture from the air. Changing to himalayan salts might reduce the amount of hardening going on in your jar. I make a balm with infused oils and some essential oils. I would love to figure out how to use the infused oils and essential oils in a bath product. But the balm uses allot of infused oil, shea butter, beeswax, olive oil, and coconut oil. I don’t need the beeswax or shea butter or even the olive oil… but I use the coconut oil to infuse my herbs. I love in an extremely humid climate, not to mention the Mississippi river is across the street from me lol. Do you have any tips for me to make bath bombs or salts to incorporate my infused coconut oil and essential oils? Amber, I use herb infused coconut oil in my bath bombs. I shrink wrap my bathbombs after making them since wher I live in Virginia is so high in humility. I use Epsom salts and witch hazel. Storing them this way, I have never had them fizz or soften. Hello! Thanks for the great article. I am looking into acquiring the ingredients now, and noticed that your link for rose geranium oil leads to an oil that is pure geranium. After looking into the price of actual rose oil, I realized that a small bottle could cost me a few hundred bucks, which is probably why the geranium oil is used? Can you shed some light onto this? Are geranium and rose scents interchangeable in this situation? And rose essential oil…geez! Did I misread it? Why would anyone spend all that on DIY?! Hi, LOVE your blog, super helpful! I use Holi to color my bombs. It’s highly pigmented corn starch so it would be in the dry ingredients, they use in the color festivals… my question is: Following your recipe, how much do you think I should add? Where do you get the rose hip extract/colorant?? You can try another clay or tapioca starch or arrowroot powder. Does the ratio stay the same if you substitute, and can I substitute the kaolin clay with corn starch? Yes you can substitute with corn starch. Keep the baking soda and citric acid the same though. My bombs fizz great but chunks are left at the bottom of the tub.i think they are the emulsifier…is there a trick to mixing out all the chunks? My emulsifier is so thick…. Are you using clay? It could be the clay not mixing with the water. The emulsified is liquid and should be mixed completely in the bath bomb ingredients so it shouldn’t chunk up. Look at your ingredients. Which one would not be water soluble? Once you figure that out, cut back on that ingredient in your recipe. Thank you! I use clay. My emulsifier is thick like molasses. Are there other emulsifiers that are more like liquid? My sunflower lecithin is very thick as well. I use a knife to pull some out of the bottle. You can make it more liquid by placing it in a sink of hot water. I found something called rose clay powder. How do you think this would work in place of the Rosehips extract and clay your recipe uses? I am hoping to try making these in the coming weeks! That seems like a reasonable substitution. Just replace the essential oils. Do you have a suggestion for making my BathBombs hard? I’m having a hard time with them cracking and crumbling when they are held too tight or breaking in packages when I ship them to customers. Thanks in advance! Use less oils. Oils tend to make them crumbly. Also make them on a dry day with low humidity. Is all lecithin dark with that kind of nutty smell? THe sunflower lecithin affects SMell and color. I wanna know, I’ve made a few bath bombs before, but the wind up like fizzers. I want to know what I should add to get that change in water color that some store bought ones have. That you will need to make an embed. There are videos on youtube to show you how. Also, may I ask if emulsifiers, sunflower lecithin in this case, can be used for other recipes as well without affecting the overall recipe? I use sunflower lecithin in lotion recipes, bath salts, and anywhere that you want to blend oil and water or prevent an oil ingredient from floating on the top of a liquid — like a bath product. What materials are the best molds made of? I’m seeing cute silicone ones but will they work? Generally silicone molds are used for soap. The product has to dry and harden in the mold to take on the mold design. With bath bombs hard sided, two part molds are best, since before the bath bombs dry they don’t have much shape. Thanks so much for the recipe. My completed bath bomb is a lovely yellow color (I don’t add any coloring) however after several days they turn green!! Whats happening? Is it mold? It still smells like the essential oils. If it was mold the green color would be on the outside only. If you scratched it the surface it would be yellow underneath. But if you are letting it dry completely before packaging and using alcohol instead of water to create the bath bombs, it shouldn’t be mold. Mold needs something to feed on like a starch or sugar. It could also be oxidization, if you used plant material in the bath bomb there might be oxidization, but I haven’t heard of that before. Yes I use the sunflower lecithin as an emulsifier to let the oils stay mixed in with the water. It works like a charm. And in my opinion does prevent the oil filming in the bath tub. Of course I would still caution against slipping because anyone can fall getting in and out of a bath tub or shower. Nonslip mats are a good idea, especially if the floor is tiled. So many great suggestions. Thank you! Thank you! Thank you! Have you ever tried swapping citric acid for vinegar powder? I was thinking that the vinegar might make more of a fizz. I’d really appreciate any thoughts you might have on this. Hey thank you so much for this article it was honestly a blessing!! But what if I want to add only 1 oil? How many drops would I add? And what if I want to do two different types of oil? How many drops of each would I add in that case? Do they lose the alcohol smell as they dry? I can smell the peppermint I used but they mostly smell like rubbing alcohol! However they worked out so much better than my first batch, so thanks!! The alcohol evaporates and the smell goes away completely in a few days. The alcohol could be 98% isopropyl. You want to avoid water. Isopropyl evaporates quickly at room temperature so there is less chance of fizzing if your environment is humid. Celtic Sea salt is what I used in my recipe. You can use any sea salt except Dead Sea Salt which contains a high percentage of magnesium and draws moisture from the air. Even this may work if you live in the desert. It’s a problem in areas with high humidity. I find my isopropyl alcohol and Celtic Sea Salt in the grocery store in BC. If you are in BC try “Choices” or another natural food grocery store. Costco carries the isopropyl too. I am curious as to how people are making and selling these and making a profit when the oils are expensive. So my friend and I attempted today to make bath bombs for christmas presents. They all broke in half. I bought the plastic mold. Once I got it snapped together we then had a hard time opening it up. I was told to rub some Cyclomethicone on the inside of each half of the mold and to also use witch hazel for the spritz to get it moist. What are we doing wrong? 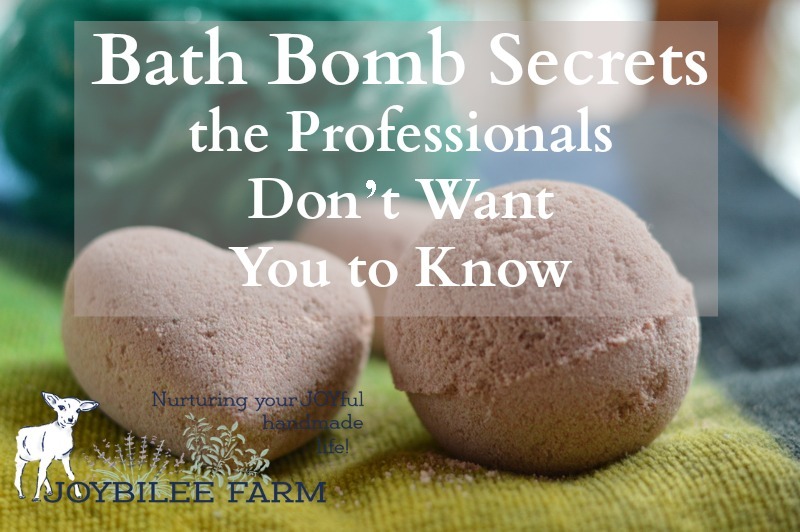 We really want whole bath bombs for gifts but we may have to settle on 1/2 a bomb instead? You may need just a little bit more moisture to hold it together. Also you need to over fill both halves of the bath bomb molds and then press firmly together. Open them up after just a minute and gently place it on a tray with parchment paper to dry. I didn’t have any luck with witch hazel as it fizzed too much here. I live with high humidity. You might try switching it out for alcohol. How did you get them out? Can I use powdered lecithin? As part of the 1/2 part modulator? You suggest Turkey red as an emulsifier. I have castor oil (not labeled as turkey red) will this work the same way as an emulsifier in the recipe? No, Turkey Red is a different product than plain castor oil. Can’t wait to try your recipe! I love your recommendations. I tried a coconut oil/epsom salt recipe last night, but we live in Oklahoma (currently 80% humidity), and my bath bombs look like muffins. Could I put them in the oven to dry and powder them then add an emulsifier and more citric acid and alcohol? Or just powder it to use as bath salts? Or just scrap the recipe and try again? I would just powder them and use them as bath salts. Epsom salts don’t work well in bath bombs in areas of high humidity. Hi Im from Jakarta and its extremely humid, been trying to make this bath bombs for aaaages and it never ever works. I tried epsom salt polysorbate80, regular salt, food grade citric acid, u name it. It just.never.works. I came across this blog and read trough it, decided to give it one last try. And IT WORKSSSSSS OMGGGGGGGGGG so haaapppyyyy. Thank you so soo muchhh. My sons love them too and now theyre always looking forward to bath time! Just notice that when using cornstarch my bathbombs smells like flour, if i dont use any they fizz prematurely. any tip? I’ve never had that problem. It depends on the recipe that you are using. You can always use a little less and add more essential oil to your batch. I always add double the amount of essential oil and people love it. I also forgot to tell you make sure by all means you pour what ever liquid in with the dry that you do little at a time and use your hands to mix it all together, thats why peoples bath bombs fizz. Hope this helps. Also I dont use water at all. I have people tell me when they use bath bombs that contain water their skin doesnt feel soft. When they use mine because i use coconut oil, their skin feel very soft and they love it. Great blog!i want to make some and sell them in my salon ! I live in a super humid climate so have been keeping my bombs in the fridge as the slightly melt or the edges fall off whn left outside ! What is the ingredient to make them super firm yet fizzle in water ? 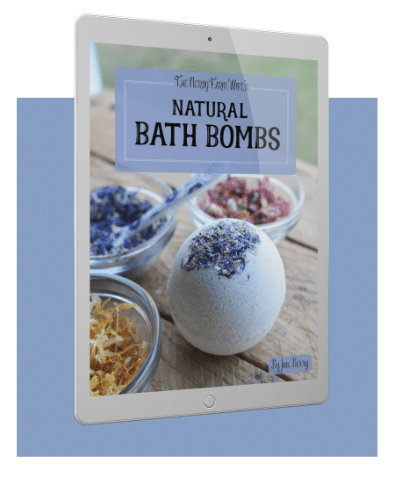 Epsom salt is high in magnesium and as such absorbs water out of the air so if you live in a high humidity area you will have problems with epsom salts in your bath bombs. Try using sea salt instead and see if that helps. I’m thinking about making bath bombs for the first time to sell as a fundraiser for a mission trip and I’ve seen a lot of recipes online. I want to make sure I am making them right so I don’t sell faulty products. Is there any way to make sure they don’t sink to the bottom? Am I able to substitute the essential oils in your recipe to create other scents? I am only able to find 99% Isopropyl Alcohol, will this work the same at the 95%? Lastly I’ve seen recipes use dried flowers, will this effect the recipe in any way? I don’t know any way to keep them from sinking to the bottom of the tub. But the fresher they are the more likely they are to float. Dried flowers are fine and won’t affect the recipe. Your 99% isopropol alcohol is fine. Thank you for the recipe. Adding the clay really helped bind my bombs together. I tried adding Polysorbate 80 to my bath bombs (so many recipes call for it). They turned out great and looked really pretty. However, they sunk to the bottom of the tub and hardly fizzed – more like foamed. Do you know anything about Polysorbate 80 and why this might be happening? Do your bath bombs float? I have been trying to get them to float and not sink, but I’m only successful about 50% of the time. I will have to give this a try. I have been making bath bombs using a Epsom salt and coconut oil recipe and the bombs turned out beautiful and firm but them become very fragile and crumble apart. I live in South Florida so humidity is just day-to-day life here. I feel that shares part of the blame for why they fall apart. Any advice when making them in a hi humid climate. I have been asked to sell at a vintage market because people love the look and feel of my bombs once used. But I HAVE TO figure out the issue of them become so fragile. Thanks so much for your article! My bath bombs came out great! However, the one thing I need to work on is the color. The rose hip extract that I used and the only one that I could find, was more of brown/orange color. My bath bombs are more of a yellowish. Would you have any recommendations for other types of natural color I could use to achieve a nice light pink like yours? I can’t seem to locate the right type rose hip extract to color them pink. You could try red rose petals, dried, and ground to a powder. The alcohol will evaporate and the finished, dried bath bombs won’t smell of alcohol. How can you fix ones that break in half or don’t join together??? What I do is crumble them again and try to press them again together. You need to overfill both halves of the mold and then press together hard so that the overflow squeezes out the seam. Then let them sit for a few seconds or minutes before you press it out of the mold. Sometimes if the whole batch is breaking you might need to spritz with a bit more rubbing alcohol so that it holds together more firmly. If it’s already dried you can place the powder in a jar and call it fizzy bath powder. Smart! I just started making bath bombs… this is great advice!! I learned so much from you today! What can I do if I live in Florida and the percent of humidity is never lower of 66%? Is there a chance for me to make bath bombs? Any trick or advice to challenge the weather? Try putting them together with 1/3rd the moisture that I used. With high humidity they may not need much extra humidity to make them stick together. I have had 4 failed batches of bath bombs. They just want dry or harden correctly. The oils I used are Shea butter, almond, tea tree, peppermint, and eucalyptus oil. I tried this last bunch without any alcohol or liquids, just the oils and colorants. I didn’t get any fizz while mixing,, but they are hard soft. My question is, what is the best way to get the bombs to harden? You could be using too much oil. Oil doesn’t harden. Try decreasing the amount of oil you are using. It should be a very small proportion to you total recipe. how many do you get out of a batch? It depends on how big your mold is. Would you be able to use the solid, powder form of sunflower lecithin and get the same result? I’ve read that the liquid form is quite thick, sticky, and difficult to work with. That’s a good question, Johanna. I’m working with the liquid form. It is sticky and thick. I don’t find it difficult to work with though. It mixes in easily with the oils. If you try it with the powdered form, let me know how it works for you. Not when making bath bombs. The soap is water based and will make the ingredients in the bath bombs fizz. Making them ineffective. How well does the sunflower lecithin work as far as an emulsifier and also preventing oil from sticking to the tub,etc? I have been trying to find a natural avoiding Polysorbate 80 in order to make a clay/charcoal type bath bomb. If you can imagine what that could look like if it sticks to the tub and your body…YUCK! Thanks for the feedback on the sunflower lecithin and how effective it is. Appreciate it! It works really well. I’ve been pleased with it. Bunch of Rosehips from our property.! I habe divine calendula rosehip oil infusing now, and I’ll use that for the oil portion. But for the color: Should I just make an alcohol extract? A glycerin extract? Hi, Nicole. All good questions. First, the plastic molds are fine. I used both the plastic heart shaped molds and the stainless steel spherical molds and I didn’t see any difference in the effectiveness. The heart shaped molds are a personal favorite of mine. The rosehip extract is a water soluable pink colouring made up of dried, finely powdered rosehips. I bought a commercial product but you could certainly use your own rosehips, minus the seeds and blossom end. The powder is just stirred into the dry mixture. The colour comes out when you spritz it with alcohol. Awesome post I love your blog! I am a licensed massage therapist and I currently teach massage therapy in my area. We are doing hydrotherapy and aromatherapy now and I stumbled on your bath bomb recipe while looking for things for my students to learn to do. I have a few questions. Do the bath bombs have a shelf life and if so how long? I know some of my students are little squirrels and like to make a bunch of things to stock pile, so I want to let them know before they make a huge batch and are unable to get rid of them all before they go bad. Also, does the scent from the bath bombs fade if you keep them in an open area for too long? I had tried making my own many years ago, and they smelled wonderful while drying, but barely had any scent at all after packaging them. Is there a way to avoid this? Yes, they should be used up within 30 days. They don’t go bad per se, but they lose the fizz and the scent over time. This is more important if they are made for sale. But even without scent and fizz the salt is therapeutic. So I wouldn’t consider a bath bomb wasted if it didn’t fizz. So recently I’ve been trying to make bath bombs. I’ve been using coconut oil and I don’t know if that’s what’s causing this issue or not, but is it normal for the oil to rise to the top of the bath when it’s dissolved? If not how can I solve this? Shana, you need to add an emulsifier to your bath bombs when you use an oil. This will keep the oil mixed with your water. In my recipe I use Sunflower lecithin. Other emulsifiers include Turkey Red (an extract from castor oil) and soy lecithin. Thank you for your “hints”. I will be trying these again using your recipe. My first few attempts last year on bath bombs definitely bombed and not the way they were supposed too. Also love the jar and bath scrubby idea! I commented once before but now I have a question. How do I modify the recipe to be a Shower bomb? Or do I need to? I want to use eucalyptus, peppermint etc for respiratory aids in the shower. Ok, so I am willing to try this recipe. I have tried three others and my husband could not stop laughing at that point. In fact he went out and bought a couple for me! I had the biggest messes on my hands! Shower bombs are a bit different than bath bombs. You would completely omit the oils in a shower bomb so you don’t have a slipping hazard. As far as oils, can you use sweet almond oil or fractionated coconut oil? Are the suggested oils for a particular purpose? Thanks! Yes, the oils I recommended are ‘drying oils” so they won’t leave a greasy feeling on your skin. You could substitute hempseed oil, grapeseed oil, flaxseed oil, walnut oil, for the same nongreasy effect. However, rosehipseed oil is also high in antioxidants and it is a rose bath bomb afterall. Almond oil, fractionated coconut oil are “greasy” oils. You can use them instead, but they won’t feel the same as using a drying oil. Thanks so much for this post. My daughter and I tried making Bath Bombs and the end product just overfizzed and never solidified. I’m wondering if Bentonite clay can be used instead of kaolin clay; if Himilayan sea salt would work instead of Celtic Sea Salt, and whether there’s any appropriate substitution for the sunflower lechithin. I’d love to try this recipe this weekend and don’t want to order and wait for supplies to come in. Do you think it would work with these substitutions? Hi, Michelle, Yes, bentonite clay can be used instead of kaolin clay. Another clay like french green clay could also be used. The only clay that wouldn’t work is Dead Sea Clay as it has too much moisture. Yes you can use Himilayan Sea Salt instead of the Celtic sea salt. However, don’t substitute epsom salts or dead sea salts. They absorb moisture from the air and encourage fizzing, due to the magnesium salts in it. 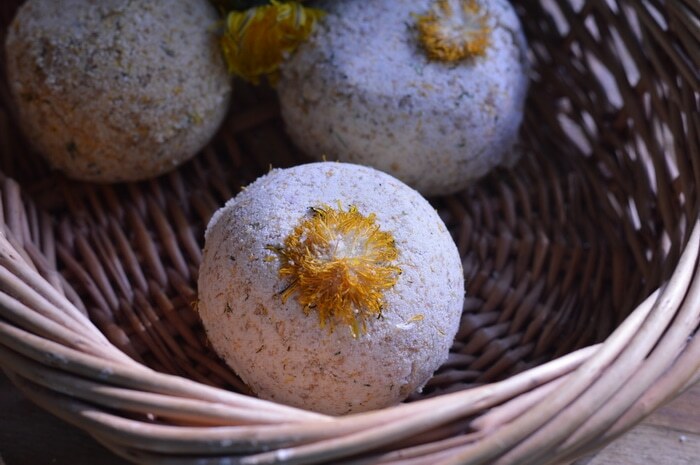 The sunflower lechithin is used as an emulsifier to make the other oils in the bath bomb mix easily with the water. Other emulsifiers include soy lechithin and Red Turkey oil can be used instead. You could omit both the sunflower lechithin and the other oil. But if you just omit the emulsifier you’ll find that the oils tend to float on the surface of the water, and cling to the sides and bottom of the tub, making a slipping hazard. THANK YOU so much! I’ll look for the sunflower lechithin and my daughter and I will give it another go with the other substitutions. I found that the rubbing alcohol really made a difference in mine compared to water or even witch hazel. Good luck with your next batch.